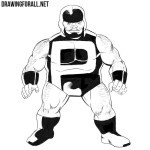 On our site there is an incredible amount of different superheroes and supervillains from different comic book universes. 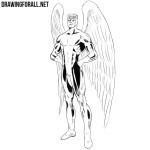 We mainly draw very popular characters, such as Wolverine or Thor, but in this lesson we will show a more unusual character. So let’s start a lesson on how to draw Xorn. 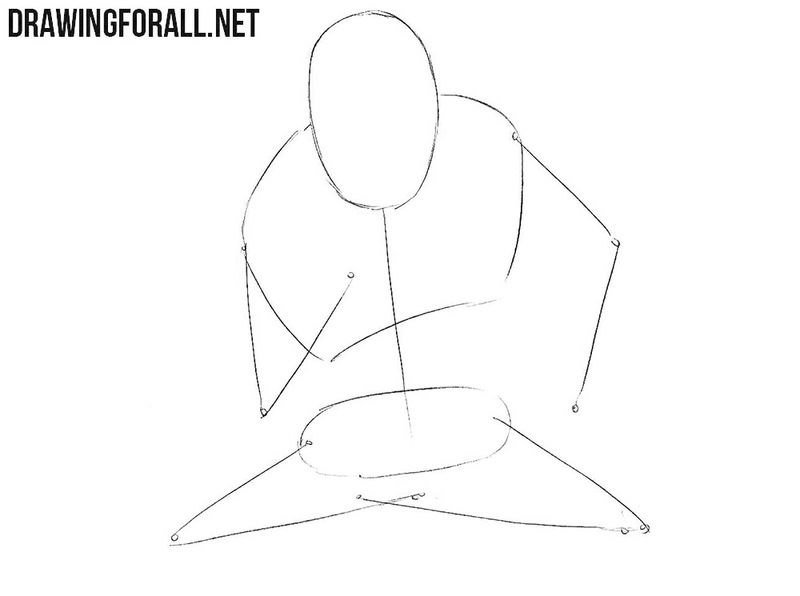 Our character sits in a very unusual position, but time all the principles of drawing a person will be applied here. By tradition, we sketch out the head and a simple line of the spine. 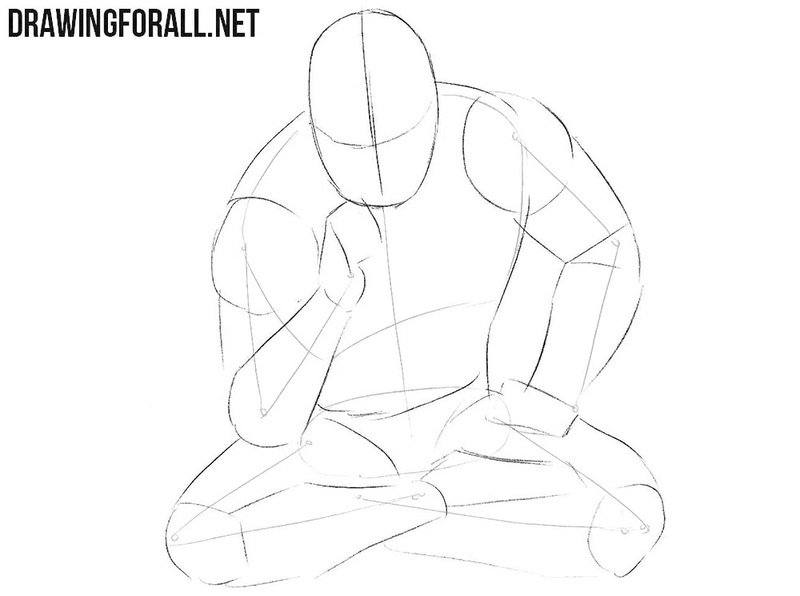 Next, we outline the equally simple outlines of the chest and pelvis. We finish the step sketching the outlines of the arms and legs. Almost all comic book characters are pretty muscular, and this character is no exception. 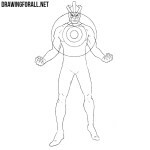 In order to convey this, we sketch out the outlines of the body parts using simple geometric shapes. But first we draw two intersecting lines on the face, then the outlines of the torso, arms and legs. Now let’s sketch out outlines of some basic details on the body of Xorn. Starting from the head, we sketch the outlines of the eyes and mouth of the mask. For this we will use the intersecting lines from the previous step. Next, we move lower and sketch out the outlines of fingers and clothes. A simple enough step, and we think that you will not have problems with its implementation. Here we just need to accurately circle the outlines and details of the mask on Xorns’s head. Grab an eraser and erase all the unnecery guidelines from the head. 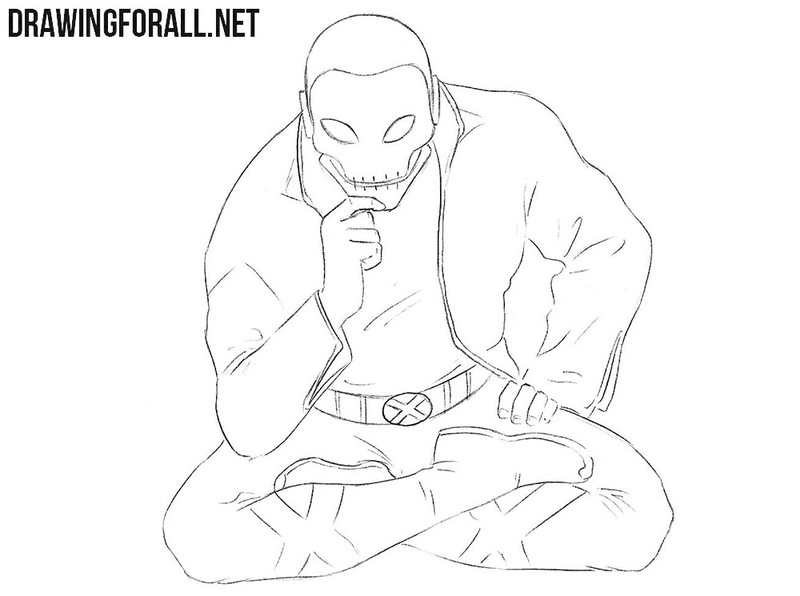 If you have already drawn the head of Xorn, then it’s time to move a little lower and start drawing the details of the torso. With the help of clear and dark lines, we will carefully circle the outlines of the jacket and torso. Remove unnecessary guidelines from the torso of our mutant. In the previous step we drew the torso of Xorne, and in this step we will be drawing his arms. So, continuing the lines of the torso, we will draw the sleeves of the jacket, taking into account all the folds. Next we have to draw hands and remove unwanted guidelines. Now we need to draw out the lower part of the body of Xorn. According to the principle from the previous step, we will carefully draw the outlines of the legs, as our artists did. Carefully draw the belt, shoes and remove all unnecessary lines from the Xorn drawing. So, our work on the drawing is almost complete, and for complete happiness, we just need to add some shadows. This we will do with the help of dense hatching. You can make shadows either in our example or draw contrasting black shadows, as in the lesson about Professor X. We have prepared for you a huge number of various drawing lessons that will appear on our website in the very near future. 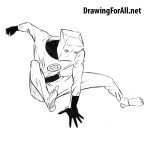 So do not forget to visit our site as often as possible, so as not to miss the new lessons from artists of drawingforall.net.